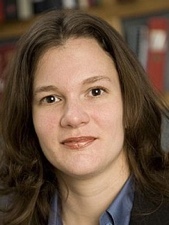 The Sierra Club has singled out as a legal hero Mary Cromer, a 2006 Washington and Lee Law graduate, for her work as a staff attorney for the Appalachian Citizens’ Law Center. The ACLC, a small, non-profit law firm, is dedicated to protecting coalfield communities and the environment from destructive coal-mining practices in central Appalachia. Formerly a clerk for the Honorable Glen Conrad of the U. S. District Court for the Western District of Virginia and an associate attorney with the Southern Environmental Law Center, Mary has represented individuals and families who have lost their well water because of nearby coal mining, and has fought pollution from coal mining under national environmental laws. According to the Sierra Club, Mary is representing the Sierra Club and an organization called Kentuckians for the Commonwealth in a challenge to a large mountaintop-removal coal mine just upstream from one of Kentucky’s best rafting destinations. Her case is challenging what she contends is the state’s inadequate analysis of cumulative impacts of mining on the Russell Fork River and its tributaries.